00:15:00 Makes 4 servings, one wrap (120 g) each. Makes 4 servings, one wrap (120 g) each. A zesty combination of tomatoes, cheese, basil and balsamic dressing is rolled up with chicken and MIRACLE WHIP to make these easy Balsamic Mozzarella Chicken Wrap sandwiches. Perfect for lunch or dinner, these chicken sandwich wraps can be made ahead for easy meal prep. Mix tomatoes, cheese, basil and vinaigrette dressing; set aside. 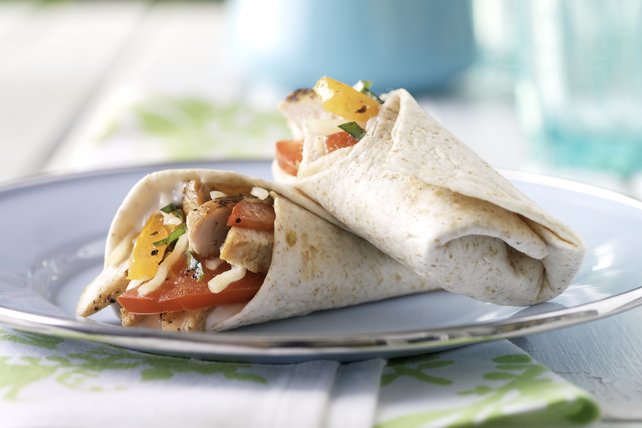 Spread tortillas evenly with Miracle Whip; top with chicken and the tomato mixture. Fold over opposite sides of each tortilla, then roll up starting at bottom of tortilla. Serve immediately. Or wrap tightly in plastic wrap and refrigerate until ready to serve. This recipe is a great way to use leftover cooked chicken. Don't worry if it has already been marinated or if it has barbecue sauce on it since that will only add to the flavour of this wrapped sandwich. Help your friends and family eat right with this delicious wrap that is prepared with better-for-you products! Serving Size Makes 4 servings, one wrap (120 g) each.